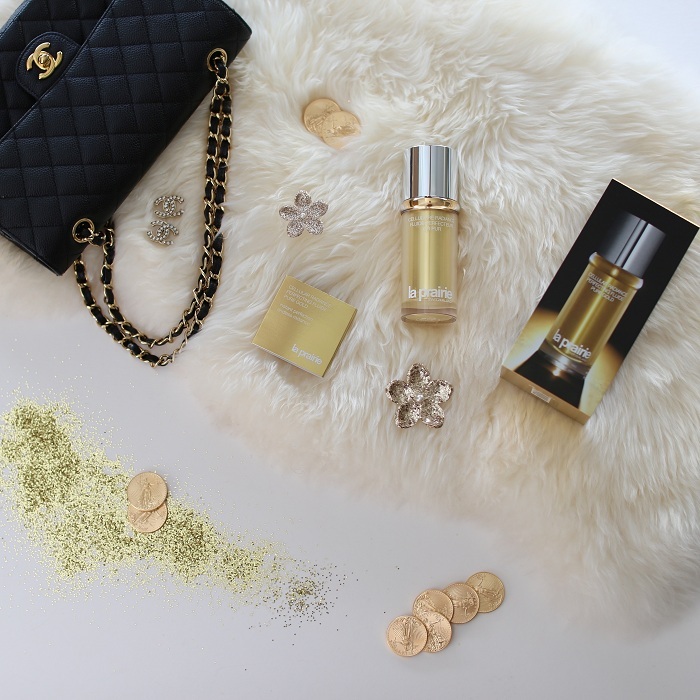 Do you girls know that throughout history gold has been revered for its many powers, one of which is its positive and lasting beauty treatment effects? Evoking the magic the ancient Egyptians and Romans attributed to this most aristocratic and precious metal, pure gold adds a visible, but subtle luminosity to the skin. Even Cleopatra reportedly used it to sleep with a gold mask every night. 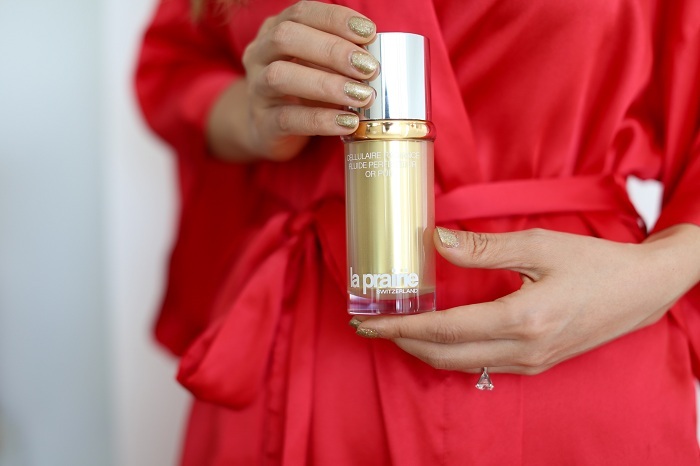 Recently, I had the opportunity to experience the La Prairie Cellular Radiance Perfecting Fluide Pure Gold. I was so excited because I’ve known the brand La Prairie for a while. My cousin has always looked her best every time I saw her. More importantly, she looks younger than girls the same age as her. She has been using products from La Prairie for years and has been telling me so much about their best skin care products. I still remember the very first time I opened and used La Prairie Cellular Radiance Perfecting Fluide Pure gold, the silky texture and matte finish feel so nice. It’s also very lightweight. Once I applied the Cellular Radiance perfecting fluide pure gold, the lightweight gel-cream emulsion became so fluid and my skin absorbed it right away. It instantly enhanced my skin’s luminosity and radiance with a glow. My skin looked so enriched with such a fine finish. La Prairie’s exclusive golden lotus Japonicus blend helps promote youthful looks and an even complexion thanks to the unique association of powerful gold lotus cell culture extracts and golden lotus root extract. The long term benefits include improved skin quality from deep within, as texture is continuously refined and smoothed. It optimizes your skin’s regenerative capacity, restores and preserves its integrity and rejuvenates its appearance. Also helps keep your skin’s appearance youthful and vital-looking. Now I use it both in the morning and at night after cleansing, toning and serum application everynight. I also apply it over my moisturizer when I feel like more moisturizing is needed. BTW, it’s also a great primer for my make-up. I put it on before I apply my foundation. This looks amazing, and you are so stunning in red!! Always wanted to try this brand; I regularly came into contact with it when I lived in Taiwan and the large department stores would carry it. Don't see it as often in the States unless it's a high end department store! These products sound amazing! I definitely want to check them out! Wow! I have heard some amazing things about these products! Beautiful blog post and photos!